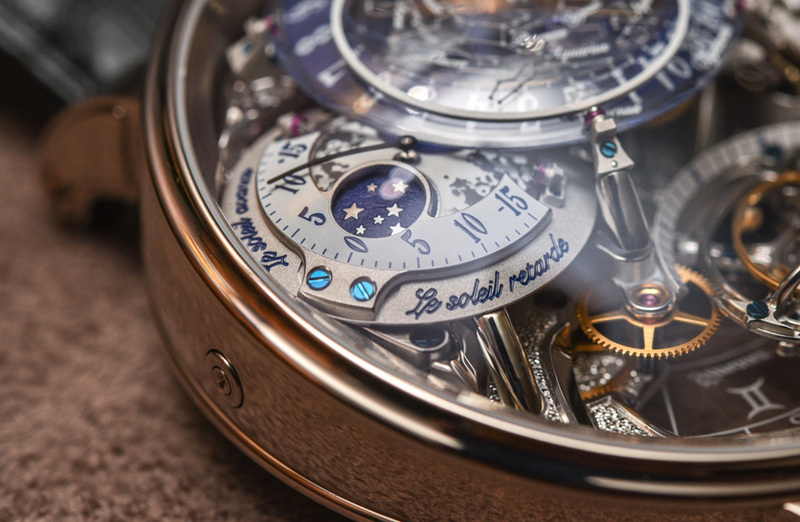 Bovet is a brand that I feel has been overlooked by many and does not receive the recognition that it deserves. Admittedly, their designs can be divisive, but it is hard to deny the technical prowess behind them. 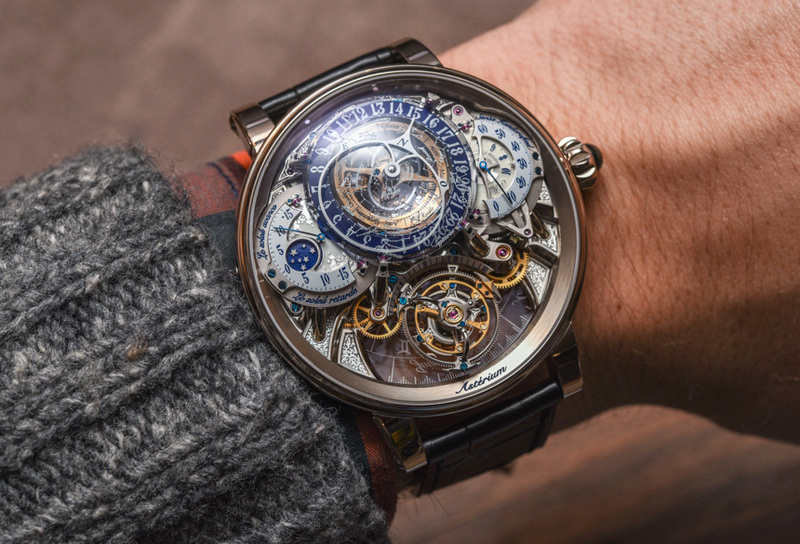 At SIHH 2017 earlier this year, Bovet released yet another super-complicated piece called the Bovet Récital 20 Astérium. 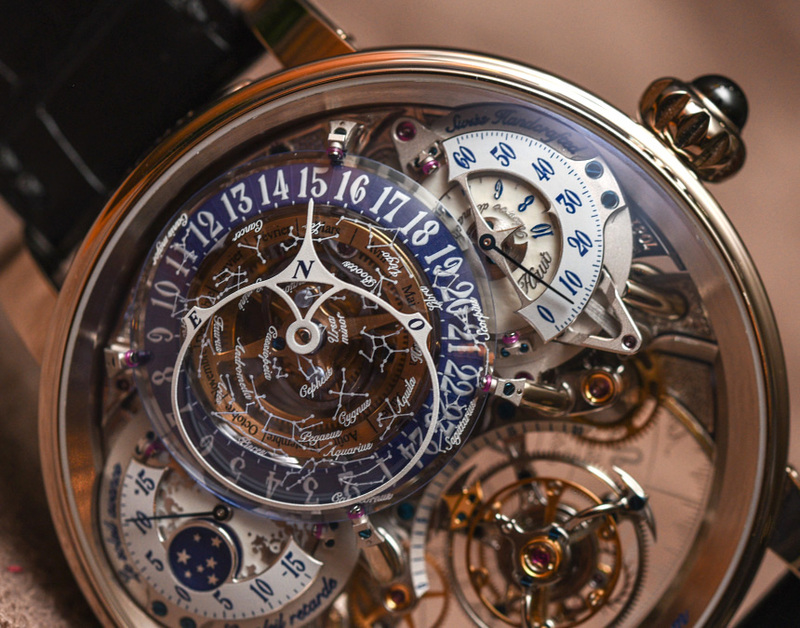 Though the watch might look complex, its complexity actually hides very practical complications. 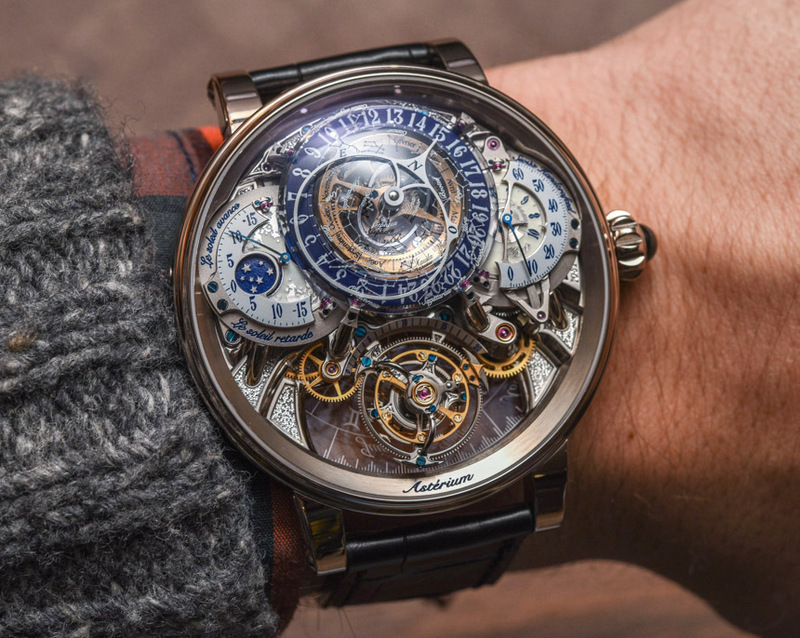 The Bovet Récital 20 Astérium is available in red gold, white gold, and platinum. The case is large, measuring 46mm across and 18.3mm in height. It is a big watch and one that has lots of wrist presence, but what’s really interesting about the case is that it is wedge-shaped. It is thicker at 12 o’clock and tapers off at 6 o’clock. The reason for this is to accommodate the movement, which has a terraced architecture, a trait that you seldom see in watches. 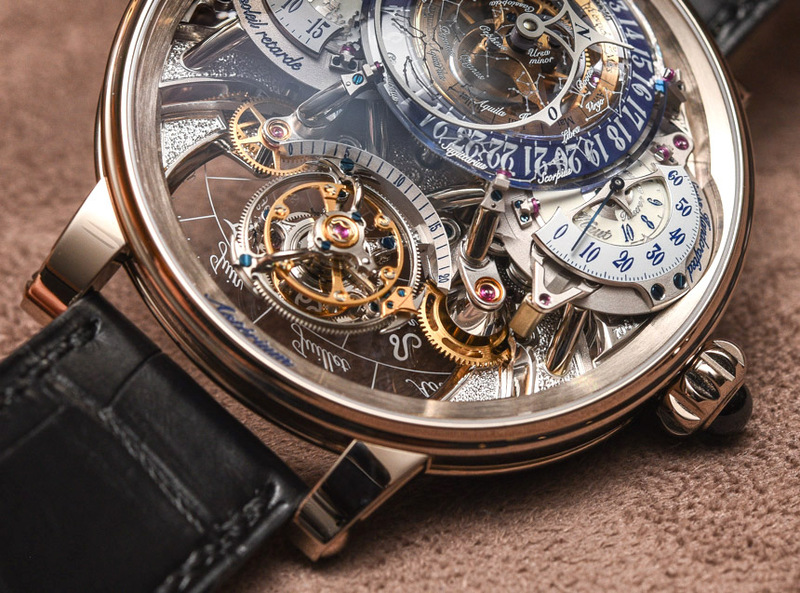 The expansive sapphire crystal is also heavily domed to provide room for the unique movement architecture. 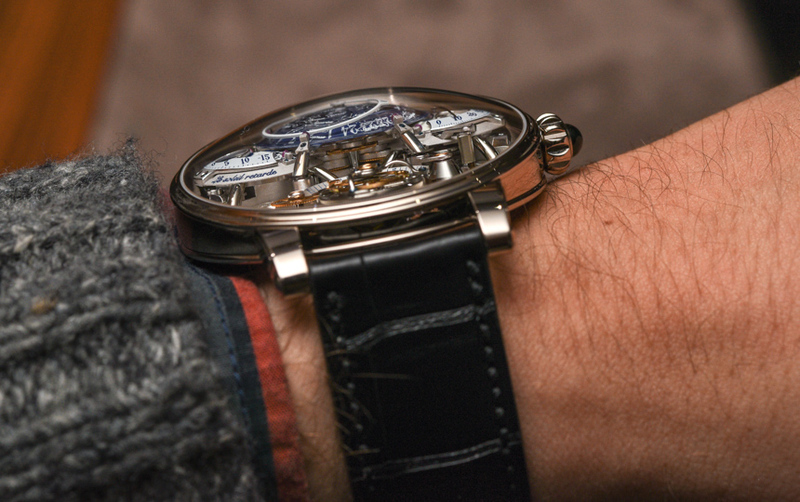 During first impressions, the Récital 20 Astérium looks imposing and complicated. The dial is busy and there are layers upon layers of details, indicators, and displays. But it is actually quite easy to read and sensibly laid out once you know what is what. 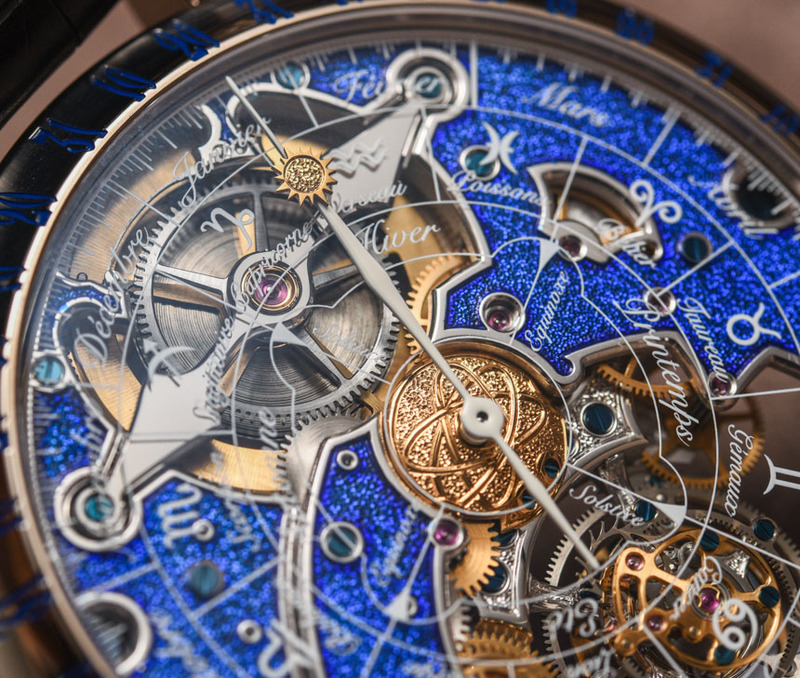 On the dial side at 12 o’clock, you have a large domed piece of transparent quartz that displays the constellations. The watch can be customized to show constellations in the northern or southern hemisphere, and the constellations are laser engraved and then filled with Super-LumiNova to aid legibility at night. Underneath, there is a disk on which the hours are printed. Finally, you have a large hour hand in white that is specially shaped to perform three functions: indicate the time, point north, and display the visible portion of the night sky. Peer closer still and you will find a month disc that moves the constellation display as the year passes, showing how the position of the constellation is affected by the months in a year. Flanking the hours and constellation display are more indicators. To the right, you have a retrograde minutes display and a very discreet power reserve indicator. To the left, you have the equation of time indicator and the moon phase display. At 6 o’clock, there is Bovet’s signature double face tourbillon, which uses an elaborate construction consisting of two levels of bridges and pillars to create the illusion of the tourbillon floating in mid-air. The end result is quite stunning. The tourbillon makes a revolution every minute and there is a marker right above the tourbillon cage that allows owners to read the seconds at 20-second intervals. 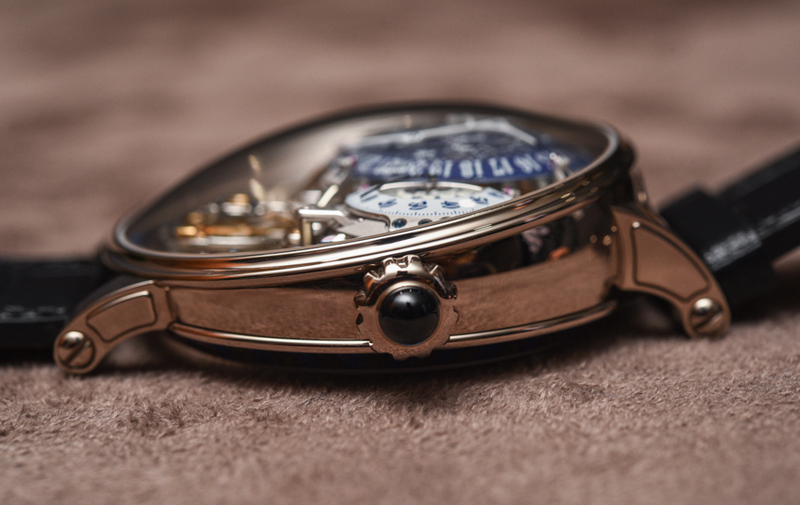 If you thought the Bovet Récital 20 Astérium was impressive on the dial side, wait till you see the back of it. 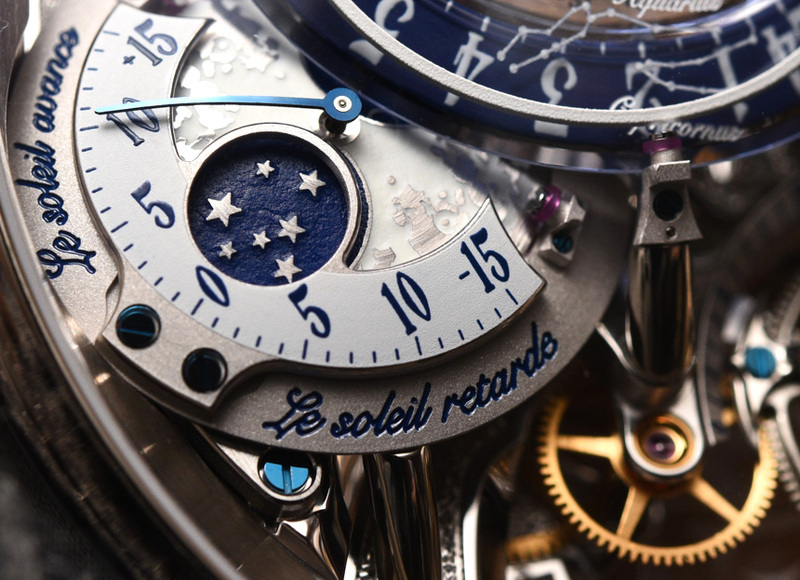 The back of the watch features what Bovet calls an annual calendar but it actually follows the sidereal year. What it really does is track the length of time it takes for the Earth to complete a single revolution when measured against fixed stars. 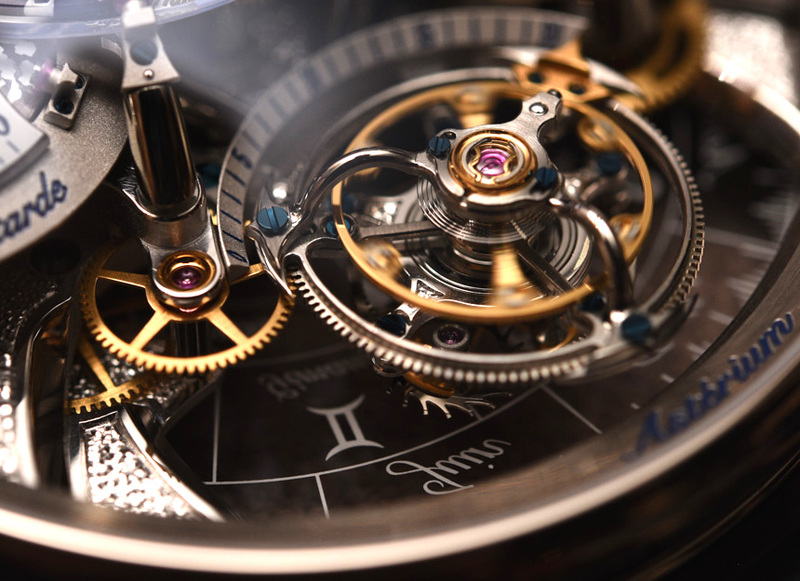 Therefore, the single central hand takes 365.25 days to complete a revolution on the back of the watch. And, as it travels, it points to the season, solstice, equinox, zodiac, and month indications that are marked on the expansive sapphire crystal. 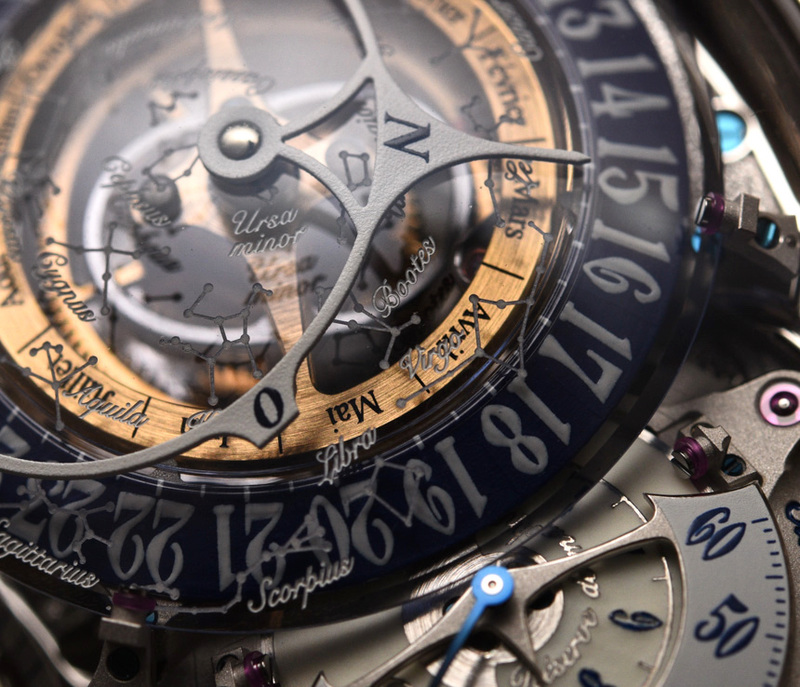 Look closer through the sapphire crystal and you can see the highly decorated Caliber 17DM02-SKY. 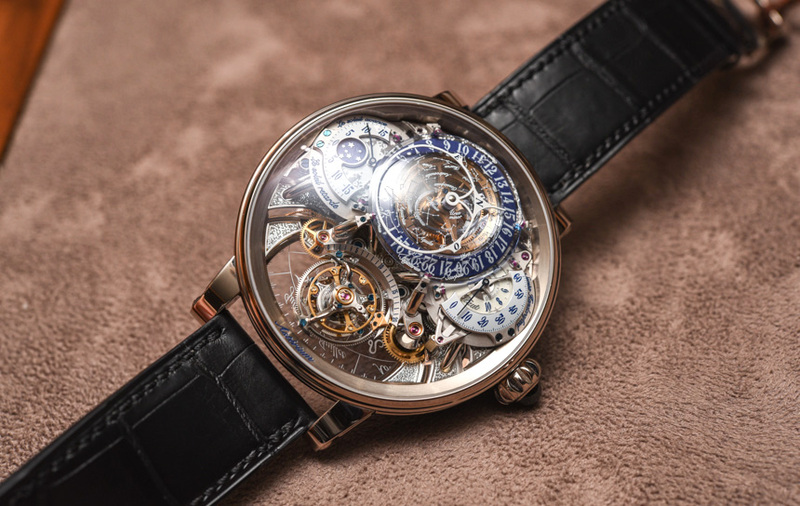 It features a single mainspring but because the movement is so efficient and also because the balance beats at a leisurely 2.5Hz, the Bovet Récital 20 Astérium has a long power reserve of 10 days or 720 hours. 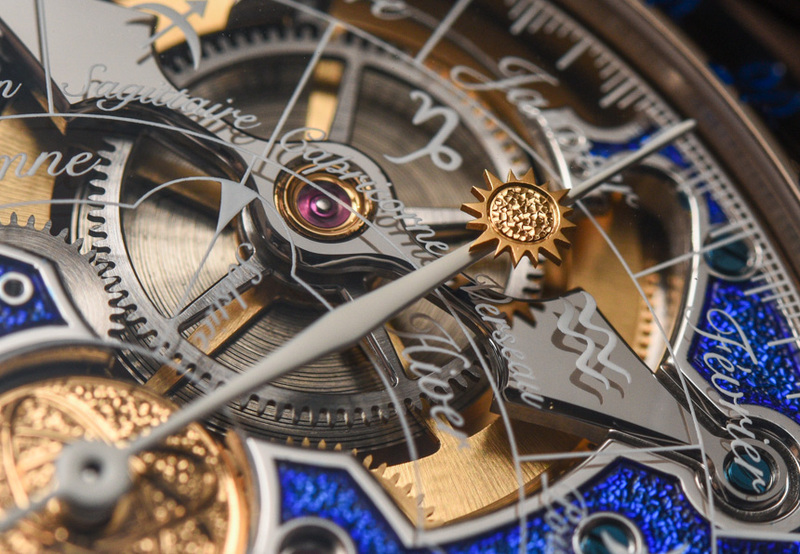 It goes without saying that the Caliber 17DM02-SKY is meticulously finished. 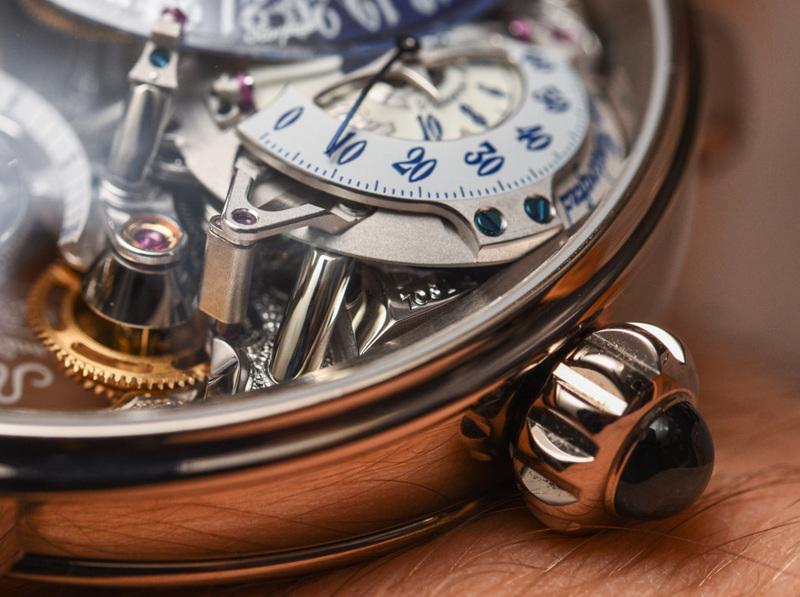 A unique type of finishing that they use is a form of engraving called bris de verre, which loosely translates to “broken glass.” This gives surfaces a textured shimmering look that closely resembles the tremblage engraving found on A. Lange & Söhne’s ‘Handwerkskunst’ pieces. Elsewhere, we have the usual assortment of haute horology finishing including hand-beveled bridges and plates, polished screw heads, polished jewel countersinks, black polish, mirror polish, and satin finishes. Coupled with the unique terraced architecture of the movement, the Caliber 17DM02-SKY is one of the most visually captivating movements I have ever seen. uh. what time is it? Simple 3.08 in the afternoon. It’s some day in January (no cheating by looking at the back), 15 hours after midnight and maybe 8 minutes into the hour – unless you are an astronomer in which case you have to adjust the time by 10 minutes, so it could be 14:58. But I can’t be sure as both EOT scales have negative values (which seems to be wrong). Just check your cell phone to be sure. It probably has the date too! 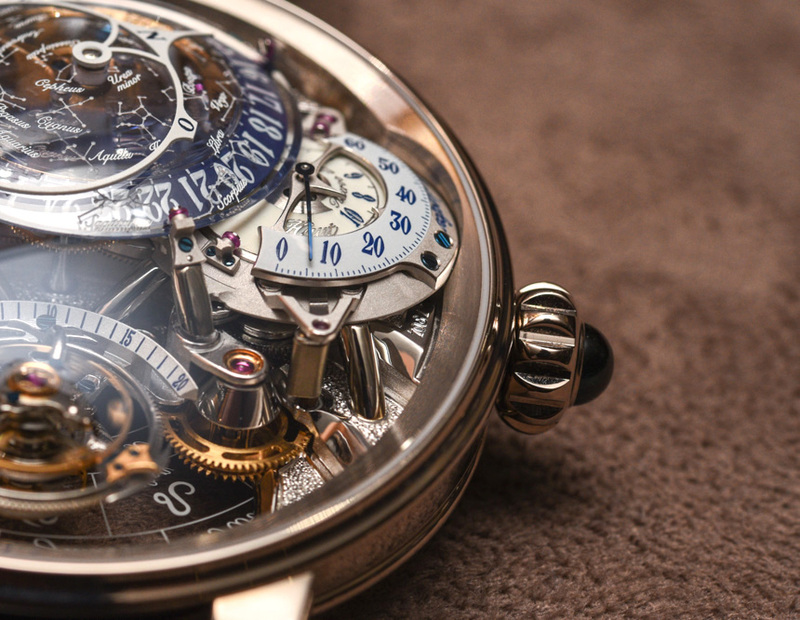 There are a few Bovet watches I find to be very appealing. This isn’t one. It certainly is a great work but far too complicated for my taste. “Less is more”, used to say Ludwig Mies. I agree with this. “power reserve of 10 days or 720 hours.” ??? I guess if you ask really nicely you’ll get the 30-day option! It’s bonkers, but I rather like it. It’s times like these that I regret not becoming a multi-millionaire in my spare time. Kinda like this one even though I’ll never wear or afford it. Buying one for myself, and one for a friend. 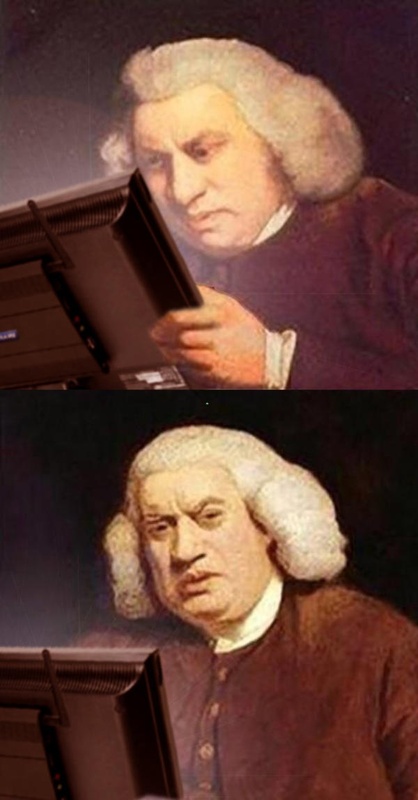 You mean when they are looking for the battery to replace? I was expecting a price tag of 6??00,000. So I guess that’s good. There was once a fellow on this site called Phil leavell (fill level?). I suspect he was also BILL and Moonraker, etc etc. He is gone now, but he came up with the idea of a sixth option to choose (see the bottom of each post where one has five variations on the theme of ‘I like this watch’). Phil proposed box six, the turd ? box. And he used this 6?? He was battling brain cancer, so his absence, temporary or permanent may be quite understandable. Thank you for that information if it’s the same guy he’s important to our family we lost contact with him about 9 months ago. The number we had form comes up out of service and emails go unanswered. Everybody the time is simple to read. Look at the big display at 12, now look at the large hand that is pointing to 15 (3 pm). To the right at the 3 o’clock position is the minutes which is between 5 and 10 depending on which picture you are looking during the course of the 4 minutes or so that Kenny took the photos. What is the fuss about! it has nothing to do with this watch, but the name “bovet” somehow sounds very bovine to me. can’t help thinking about cows whenever I see the name. Or bidet, or a bovine bidet. Now that’s a watch. As a technical nerd I could study and get lost in the details of this timepiece/astronomers friend. 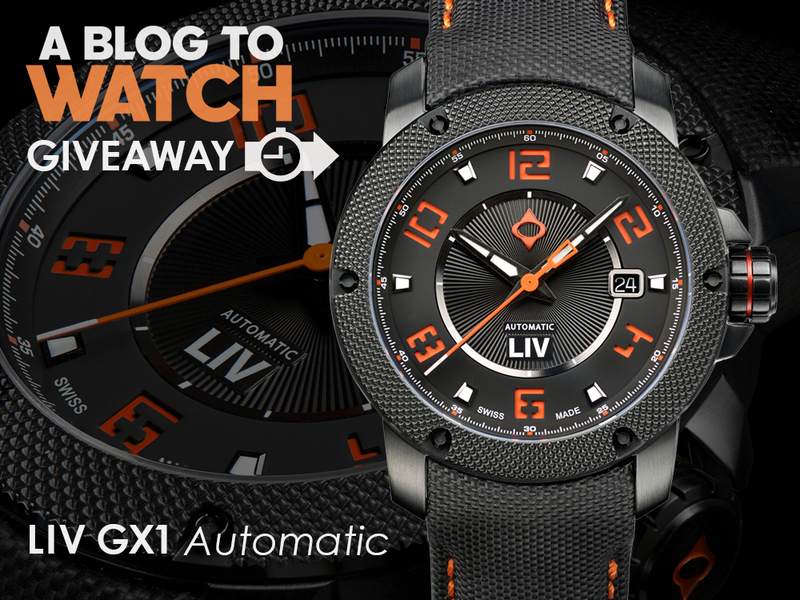 This is a watchmakers watch, not a machine assembled piece of cad cam reject junk. 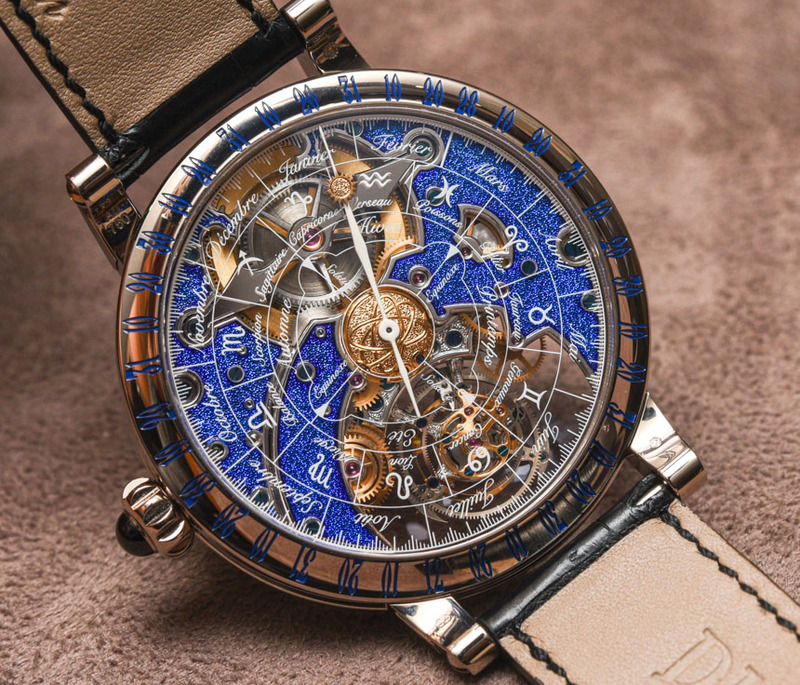 Kudos to Bovet for being different in a positive way. Some really smart guys ( and lassies ) have got round a table and spent many hours designing every feature of this elaborate timepiece, ………..and this is the final product. What a mess. Ok mechanically wow but practically i can’t even tell the bloody time without staring at it for 5 mins ( this may become easier with wear ) which is never going to happen, even if i could afford it. Horoscope and people who believes in it annoy me. I agree. Open up your heart and let the sun shine in . . . not. Again, more awful overpriced trash and junk. Compared to Jacob&Co’s “astronomical” watches it’s a bargain. Agree – but at least the Jacob & Co Astronomia is fun to watch. That watch looks worth its price tag. 46mm wide, 19mm tall, wedge shaped, huge domed sapphire, $350,000. Thank goodness the power reserve indicator is discrete. I’m offended that the constellations are presented using an assumed latitude. For this price, I would want them to make the circular portion of the hour hand reflect my tropical sky (less northern and more southern constellations visible). 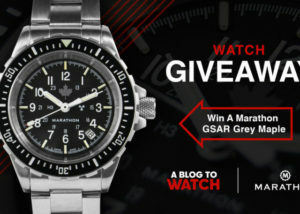 And what about watch collectors from Singapore (about 1.35 degrees north)? Canada reporting in. Northeen hemisphere constellations are the only real constellations. In the southern hemisphere George Soros funded shills hold up small lights in the sky to subvert attention from globalisation. I read it on the internet so it’s obviously true. The worst human on earth full stop. Yes I know Mugabe is still alive. Rich people subverting democracy? Like that’s never happened before. Unless I’m missing something, the only way to read (or set) the day of the month is from the back side. And then using a loupe as each day is 1/365 of the scale. Great, you can tell (via the equation of time indicator) how much solar and mean time differ, but you can’t readily tell the date. A fail of epic proportions. But who cares, this is not a watch to be worn – only collected. 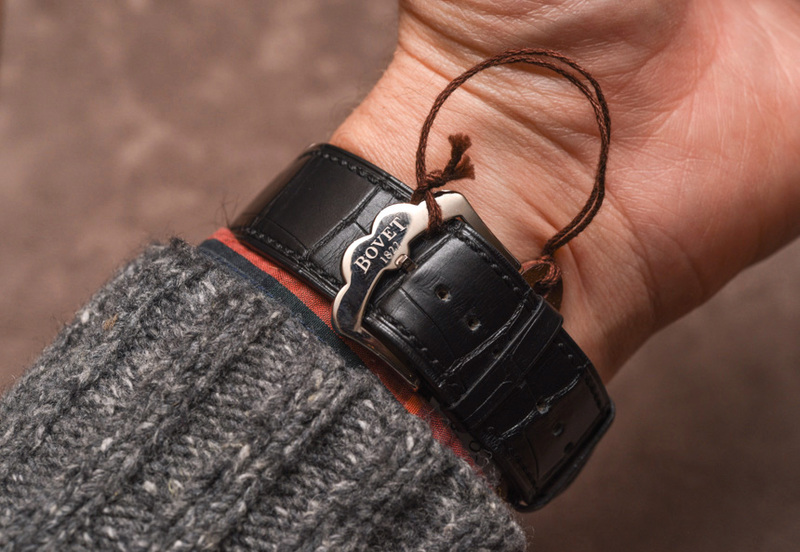 Pascal Raffy even says these are for collectors and he never stresses any real use as a watch to be worn daily. Toys for rich boys with large watch vaults. The most interesting thing to me about this watch is the tilted case. That’s about it though. Yes! This is the proper way to do a watch like this! As baroque as you can get, beautiful! We need a lume shot, those constellations have to look astonishing! I’d buy it if I were rich!